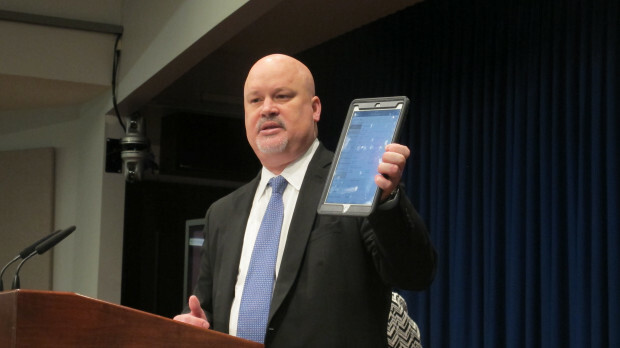 Scott Perry, Deputy Secretary of DEP's Office of Oil and Gas Management holds up an iPad. Pennsylvania regulators are slowly playing catch up when it comes to technology. After years of yearning for the latest digital tools, the state Department of Environmental Protection was recently able to send its oil and gas inspectors out into the field with iPads. The change has cut down the time and tedium of filing paper reports. Scott Perry, head of DEP’s Office of Oil and Gas Management, said inspectors are using a new app (created in conjunction with PennDOT) and said it has helped increase productivity — amounting to more than $500,000 annually, or about the cost of having six new inspectors.